A sea rescue has taken place in the Bristol Channel after an independent lifeboat issued a mayday call. Crew aboard the Portishead vessel, manned by volunteers, issued the call at about 2045 BST. An RNLI lifeboat from Weston-super-Mare and Severn Area Rescue Association craft from Beachley were launched, together with a helicopter. 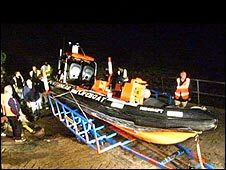 The stricken lifeboat, which was located at about 2145 BST, was then towed back to its base in Portishead. The three crew onboard were all safe, the Swansea coastguard confirmed. One of the men, Ian Lazenby, said: "Our initial thoughts were that we were definitely sinking, that's why we called the mayday. "We were in three knots of tide, heading west, going dark, would they have found us? That's your first thought, so you just get on with making sure they know where you are." Liam McDermott, RNLI volunteer crewman, said: "They are obviously going to be quite embarrassed about it but it goes to show that nobody can take any chances out there. "Lifeboating is a high risk occupation and things do go wrong. We are really pleased that nobody is hurt."